International students and staff are a valued part of the Queen’s Community. 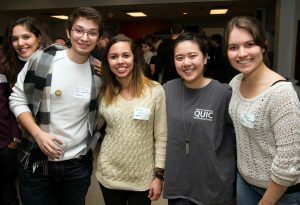 The Queen’s University International Centre (QUIC) is here to welcome you and provide support as you adjust to living in Kingston and at Queen’s. Whether you have questions or just want to say hello, our advisers are happy to chat with you. The International Student Advisors are available 8:30am – 4:30pm Monday – Friday as a drop-in service (with no appointment necessary). You can also email your questions to the advisors at ISA@queensu.ca.